This article will tell you which drone laws apply in Japan. Meanwhile, flying drones is also possible without prior permission. Not allowed are flights over roads, in the public parks of Tokyo and Osaka, as well as over the President’s Palace and other government buildings. Maximum flight altitude: Your drone can fly up to 150 meters in Japan. Maximum horizontal distance and FPV: In Japanese airspace, you can control your copter only in visibility. Compulsory insurance: We recommend buying a drone liability insurance because of the high costs in Japan. Maximum take-off weight (MTOW): No data available. Distance to airports: Without permission, your copter is not allowed to approach an airport more than 9 kilometers. Other safe distances: Flying drones have to keep always a distance of 30 meters to uninhabited persons, vehicles, and buildings. Drone missions in populated areas are permitted only with the prior approval of the Ministry of Transport. On this online map, you can see for which flight areas advance approval must be obtained. Flight bans: The operation of drones over gatherings of people is prohibited in Japan. Also, flights are not allowed over roads, in the public parks of Tokyo and Osaka, as well as over the President’s Palace and other government buildings. Flight approval: Flight approval has to be applied for multicopters in Japan if you want to fly near airports, in densely populated areas or over 150 meters above ground. The authorizations must be applied in Japanese at least ten working days in advance. 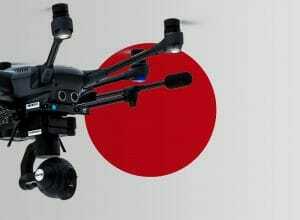 Time of operations: Japan allows the use of drones only in daylight. Regulations for commercial pilots: To our knowledge, there is no distinction of drone flights for leisure and commercial purposes in Japan. Good to know: As a protest against the policy in Fukushima, an activist has landed a drone with radioactive material on the roof of the Prime Minister in the past. Because of this occurrence, you should be particularly careful near government buildings and forgo one flight or another to avoid unnecessary trouble. We have researched the listed drone regulations for Japan to the best of our knowledge. We can not guarantee the correctness of the information. If you want to be on the safe side, please contact the competent aviation authority. Alternatively, you can also ask the embassy in your country for further information about the regulations. Please leave us a comment when you receive news and/or gain experience with your copter in Japan! Be aware that Japanese regulation about radio communication is bit strict. 2.4GHz is OK, but for 5.8GHz you need to get licenses of both radio operator and radio station. Thanks for that valuable addition! Hi Francis, do you know if I can fly my drone in Naritas Temple? Is that considered a public park? I am going to Narita and Tokio with my wife and 2 kids but I am wondering how much I would be able to fly it with out getting into trouble. Thanks.